I am back from Nanjing for about a week now and have been chasing my tail trying to catch up on things, so my apologies for the radio silence. I have had a fascination with China for many years and while I get to travel all over the world I have only been to China once before, and even then only for three days, so I was delighted to be able to spend nearly three weeks working in Nanjing, thats long enough to really get stuck in to some decent photography. Before leaving I had made tentative arrangements for a guide to be with me while I travelled the streets and took photographs. I was not concerned from a security perspective, it just I wanted local advice on where to go for the best photo opportunities, plus its too easy to get lost when you do not speak or read the language. Normally for a trip like this I would pack up a few Nikon bodies, lenses, flash and a tripod, enough to cater for all eventualities, and then leave most of them in the hotel safe. This time I was determined to travel light and packed only my FujiFilm X100s, X-Pro1 with the 14mm and 60mm lenses and a tiny desktop tripod. It all fitted into my computer bag along with a Mac and a Surface RT. I was ready for road as they say in Ireland. But plans change. The project we were working on required us to work through two weekends and so personal photography was restricted to a couple of hours each night. Walking the streets at night I couldn’t fail to notice the rising influence of western culture in China. A stark contrast to my previous visit to Beijing. Huge, brightly lit, billboards above clothes shops depicted western men and women as fashion icons. Starbucks, McDonalds and KFC stores were everywhere and young people proudly carried Gucci, Prada and other named brand bags. Below that veneer it is still undeniably China, particularly off the main streets, however it is changing at an incredible rate. Stepping out of the main streets things change a bit. The streets are crowded with very young people. Hawkers and food vendors abound and there are few westerners in sight. I seemed to be a novelty as people wanted their photo taken with me. The roads are crammed full of cars, bicycles and scooters. The only safe way to cross a road is to pick a straight line, go for it and let the traffic fold around you. Deviate from your line and your jam. 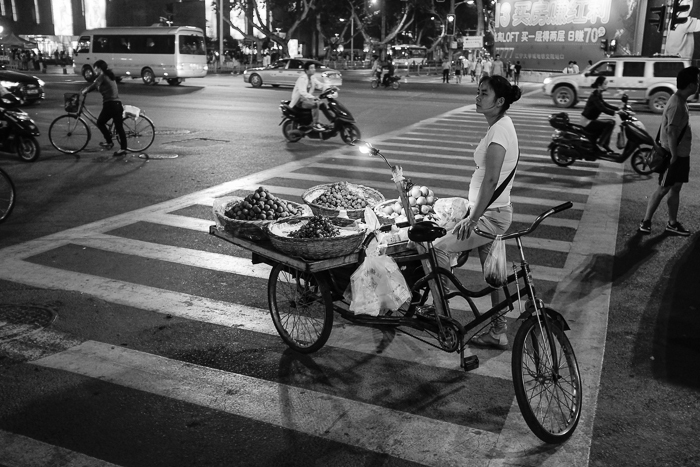 The street vendors, and in particular the fruit vendors, for me came to symbolise old China. Not because of their style of dress, but for their manner was different to the brash youth in their Gucci finery. Lighting conditions varied tremendously from brightly lit corners a la Times Square or Piccadilly Circus to dark dark streets 12 stops below sunny sixteen. My brain/hand co-ordination is not quick enough to deal with that so I put the X100s into Auto ISO. Set the max ISO to 6400 and min shutter speed to 125th of a second. Unfortunately you can not do that with the Xpro1, so it staid in the bag most nights. Using the optical viewfinder the AF seemed to handle everything that was thrown at it. After the first nights shoot, I loaded all the photos on to the Surface RT. I zoomed into one of my favourite shots and my heart sank, it was soft, not pixelated like an un-rendered image just soft. The same held true for the next three photos. Seething, I went to the loo to ponder on what to do clearly the AF was not up to the job. When I returned to the RT to my surprise the last photo I looked at now was crispy sharp on the screen. The built in app deals with photos differently to the iPAD and take a good bit longer to render. The AF actually worked fantastically well despite the low light conditions. Occasionally it locked onto the background, even my Nikons will do that from time to time if I am not careful, otherwise it got it right. I used MF some of the time, but that will be the subject of a different post. Suffice it to say it works…but. What impressed me the most about the Fujifilm X100s was its metering and DR. I left the meter on matrix mode with typically a -1/3 ev dialled in. Despite the huge DR in some of the shots the camera captured the scene as I wanted. There is a great joy in using something that is so simply and elegantly designed but also produces great results. With AF sorted, and exposure looking after itself in this set up I could concentrate on what was in the frame. The X100s lens is wider than I would normally use. For portraiture and candids I regularly use the 70/300 on my D800 for instance. Using the Fujifilm X100s you are forced to take the overall context into account unless you are prepared to get uncomfortably close to your subjects. I am finding this approach is producing much more interesting results. 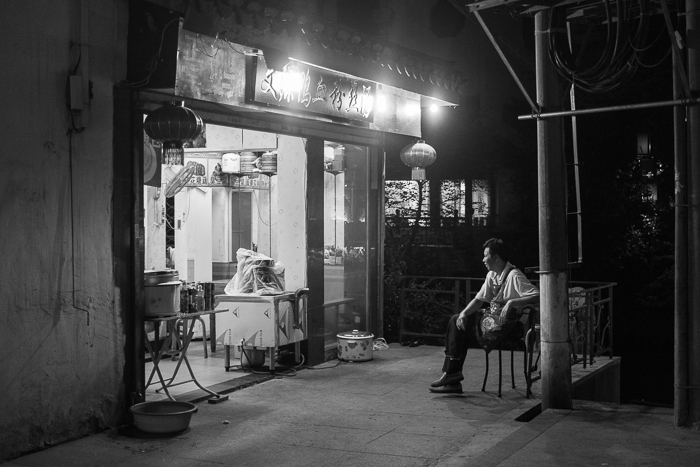 I have well over a thousand shots to work through and distill into a photo essay on the changing face of China. But here is a teaser…watch out for the full essay in part two. For anyone who would like to see more of Nanjing through the LSH’s eyes, here’s the first of a series of photographic posts. Great pictures. Like them in black and white. Seems more dramatic and real. Thank you both for your comments. I have a load more to post. WOW! Gorgeous images. I enjoyed the read, as well. Happy to hear that your loo-based seething was premature. 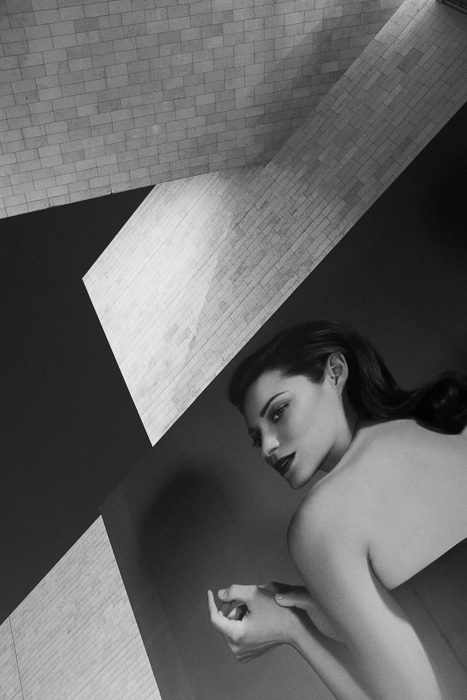 Great compositions and use of light in these. Were any/many of the above shot at ISO6400? #5 is top, George. Thanks for sharing, I am looking forward to the rest and to more of your writing! LOL, nothing a trip to the loo can’t solve. #3 and #6 were at 6400. F/2. The young lady was in a confucian temple, and was lit only by light from an ancient Stele, which was about 10 yards away. I had to drop the shutter to 1/55th. I took two shots with AF. In the first one the camera focused on the back ground as she was leaning more forward. It was actually a nicer pose but unusable. The second one is the one you see here. 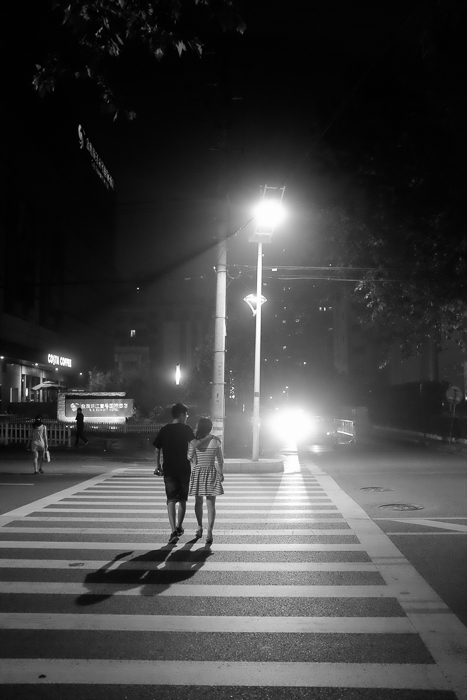 For the couple walking the street, it looks like there should be lots of light but it too was 6400/F2 and 1/70th.